A couple months ago, my son turned 1. I have no idea how it happened, but somehow we made it. Almost like clockwork he turned a corner and transformed from a baby into a toddler. He’s walking, babbling with purpose (thinks he’s talking), listens to me, kisses me, and is starting to hand me the things he used to put right in his mouth. While I loved every minute of his babyhood, I’m so happy and ready for this to happen. Despite everyone’s warnings that time will fly, the past year has actually been very long. I quite literally spent just about every waking and sleeping moment with my son, so I didn’t miss a thing and watched each and every development take place. 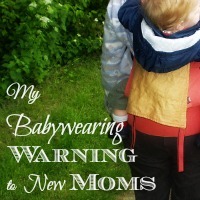 Babywearing is not a new thing. It’s been around since the dawn of time, but over the past few years it’s popularity has grown. All of a sudden, it’s everywhere. 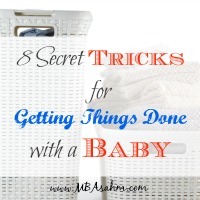 For the most part, we’re all forced to come up with creative tricks for getting things done once a baby has entered the picture. Eating with one hand, sleeping while standing, sleeping while sitting, sleeping while singing…you get the picture. I come across great ideas all the time that make my life so much easier. 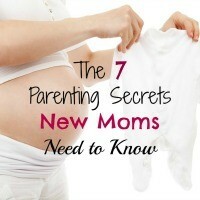 So I thought it was high time I shared my secret tricks for getting things done with a baby. When my son was 4 months old, he reached out with the speed of light and grabbed my piping hot cup of coffee, pouring it all over himself. He had just started using his hands and it was the first time he had grabbed anything. It was an awful experience and we ended up spending the weekend in the ER. Luckily, he ended up being ok with only small scars that will eventually fade. 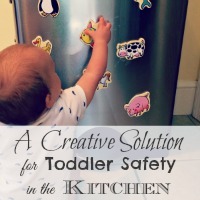 Ironically, that incident was probably a blessing because it showed me just how quick those little hands are and has made me way more paranoid about where he is, particularly when we’re in the kitchen. Unfortunately, he always wants to be with me when I’m cooking. I have tried distracting him with his favorite toys in the dining room, but he insists on being as close as possible. So here is my latest attempt at keeping him safe and I’m in LOVE with it. 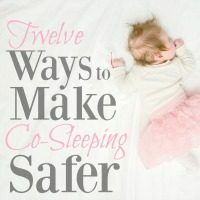 Throughout my pregnancy and even after my baby was born, I had no plan or intention of co-sleeping. In fact, my baby had two cribs to choose from and a variety of other cozy devices at his disposal. But as his 4-month mark rolled around he started to get fussier and fussier. When I put him in his crib, he would wake after only an hour of sleep. But if I let him curl up with me in bed, he would sleep for 6 hours straight. So….yeah….we became co-sleepers real quick. And I’ll tell you what, I’m so glad I did it. In fact, it’s one of the things I’m most grateful for when I look back at the past year. Before I was even pregnant I knew I was going to carry my baby everywhere. Like Pocahontas, we would run through the wilderness together. Singing, dancing, and laughing. I know, I know. Pocahontas didn’t have a baby – and God help the woman that runs through the wilderness with a baby strapped to her. 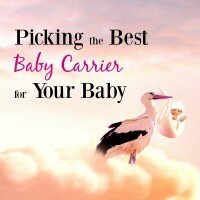 Don’t get me wrong, I absolutely love, love, love carrying my baby. It is my favorite thing to do. If I didn’t have the body of a human, I would do it 24/7. But my body – strong as it is – needs help with the task. Thankfully, brilliant parenting innovations have made my pursuit for the best baby carrier fairly painless. And I’ve tried a bunch, trust me. Some were ok, some were life-changing.